February was the deadliest month in Cuyahoga County history for fatal overdoses (60) related to heroin- and fentanyl-related use. The Cuyahoga County Medical Examiner’s Office confirmed there were 60 confirmed fatal overdoses during the month. In 2016, the Lakewood Police and Fire departments responded to 251 overdose calls, and 28 died as a result of heroin overdoses. These statistics typically aren’t the stuff of good–news and community pride. But, the problem is real. And the City of Lakewood is not shying away from the challenge. On Jan. 12, 2017, the City of Lakewood facilitated the first community leaders meeting bringing city, county, state and federal organizations and representatives together to discuss the resources available, the gaps in the resources, how to assist individuals facing addiction by providing adequate support services and funding and by developing adequate ways of communicating how to access resources. The city has partnered with a number of area agencies, organizations, support groups and residents to meet the issue head-on and provide assistance. Recovery is possible. The goal, through the city’s strong partnerships and collaborations, is to connect people struggling with addiction to available recovery resources. We want to build bridges. Mayor Mike Summers championed a resolution recently passed by city council declaring the opioid crisis in the city as a public health crisis — a move qualifying Lakewood for additional government funding to address the issue. Lakewood is doing more than other suburban communities to battle the addiction problem and still much more can be done. In what was considered a progressive measure at the time, the city equipped all of its first-responders with Naloxone, a drug that reverses the effects of opioids by blocking the receptors in the brain. When one person struggles with addiction, the problem affects their entire family — which affects friends and neighbors and, ultimately, an entire community. One person can’t solve this problem. We are stronger together. “We need to take broad action on this opioid epidemic. Its impact on families is immeasurable.”,said Mayor Summers. The City of Lakewood is partnering with the Alcohol, Drug Addiction & Mental Health Services (ADAMHS) Board of Cuyahoga County, Cleveland Clinic Lakewood Emergency Department and the Woodrow Project to create a rapid overdose response pilot program launching Fall 2017. Project SOAR is a collaborative community response to the opiate crisis. 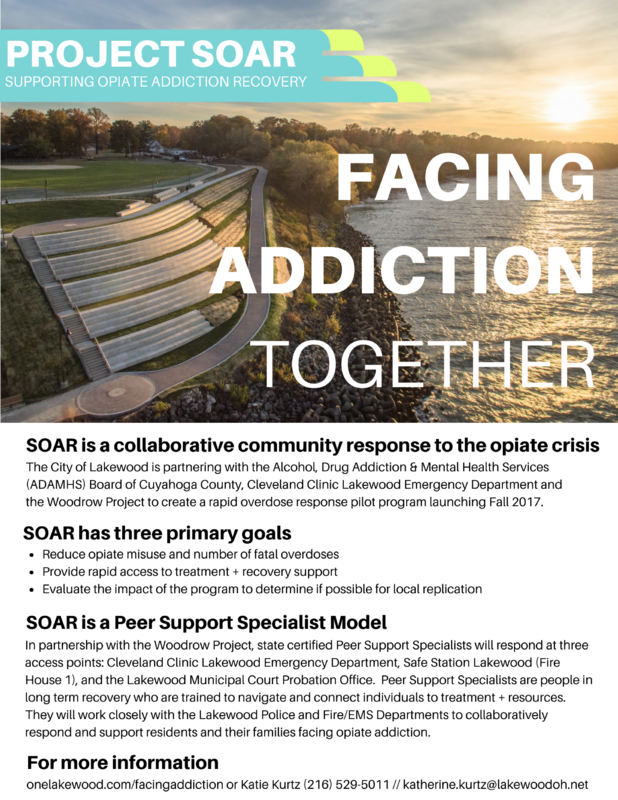 Below is an outline of SOAR and key facts about this comprehensive community response to the opiate public health crisis in Lakewood. Click here for more information about SOAR. Stay tuned to this page for more updates on Lakewood’s work to create a comprehensive community response to opiates. For questions or more information please contact 216-529-5011. Click here to view the complete Bureau of Justice Grant application written by the ADAMHS Board for the Project SOAR Lakewood pilot program. Click here for Community Resource Guide. Connect with inpatient treatment, outpatient treatment, counseling & other services.